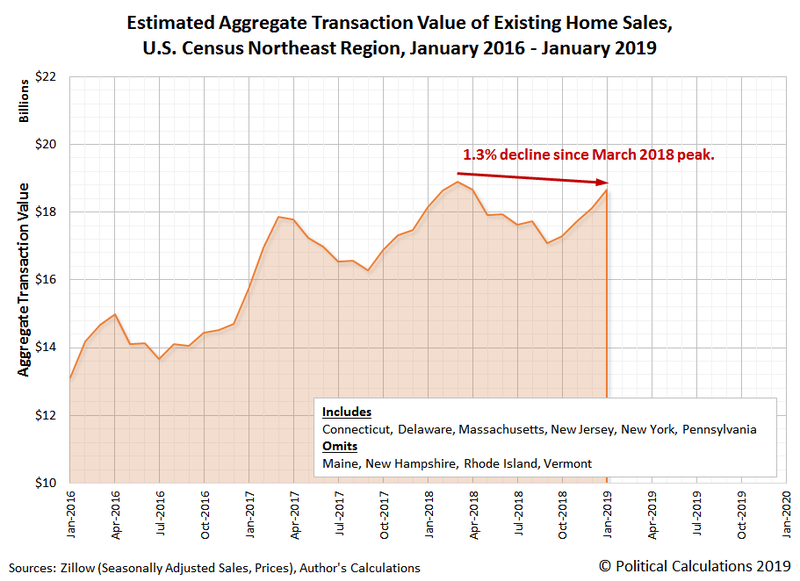 In the Northeast region, for the six states for which we have data, we find that the total valuation of existing home sales in this region has fallen by 1.3% since peaking in March 2018. 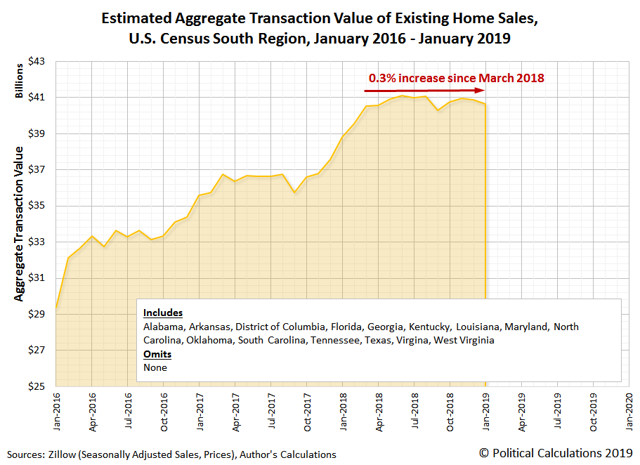 In the South, the total valuation of existing home sales has risen by 0.3% since March 2018. In the West region of the U.S. real estate market, California is leading the region down, in both total valuation and in percentage decline since March 2018. That's the mantra of real estate agents for explaining why sales in some areas are hot while sales in other areas are not. 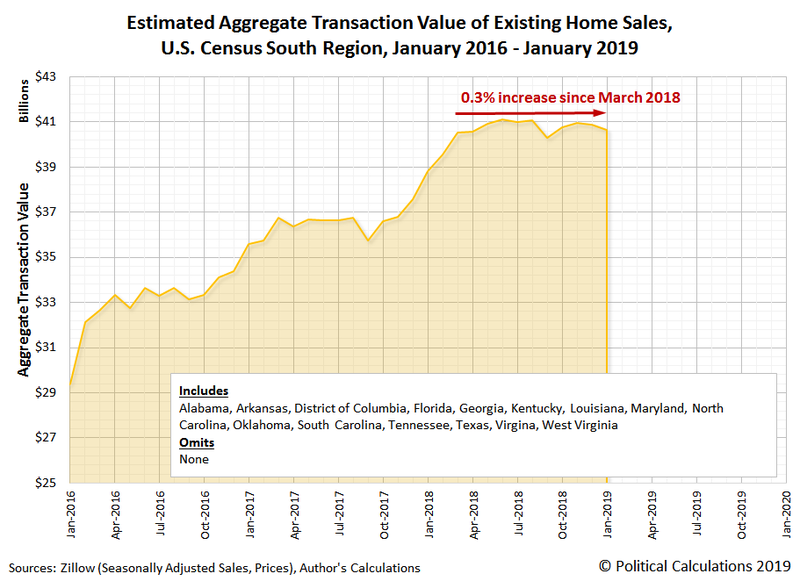 But it is also what we find when we track the total valuation of existing home sales by region in the United States, where nationally, we've found that the market peaked in March 2018 and has fallen by over 6% since, but that's not universally true across the U.S. Census Bureau's major geographic regions. Here, we have data for all 11 states in the region, but not for Nebraska in January 2019 or for South Dakota from November 2018 through January 2019. Noting those recent month omissions, which would reduce the apparent decline of 7% in the Midwest region if the data for these states during these months were available, we would very likely still see a negative trend for the region. 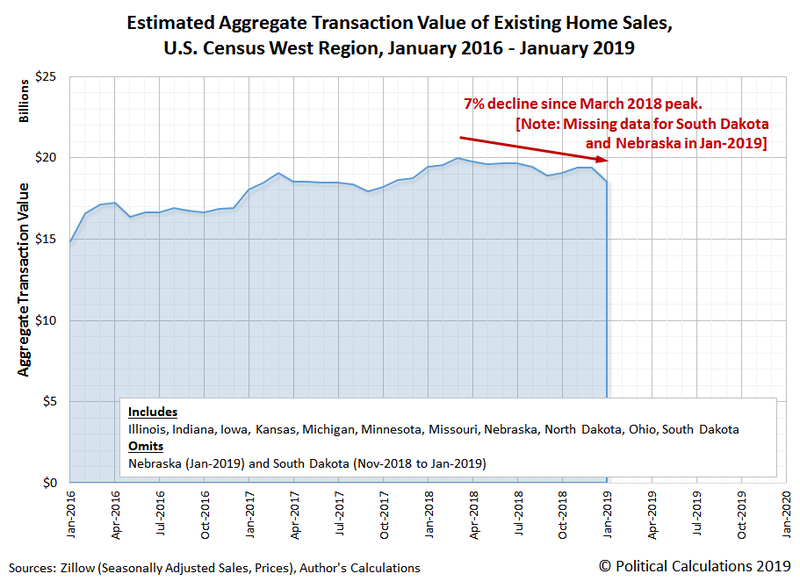 Here, although the state of Illinois accounts for 37% of the overall decline in the region, with the market cap for its existing home sales dropping by over 18% since March 2018, both Iowa and North Dakota have seen larger percentage declines in their smaller real estate markets over the same period of time. where the total valuation of existing home sales has risen by 0.3% since March 2018, as the market has largely held steady while the markets in other regions have seen drops. Speaking of which, that brings us to the West region of the U.S. real estate market. California is leading the region down, in both total valuation and in percentage decline since March 2018, with existing home sales in the state having fallen by 16.5% since March 2018, where the state's large real estate market accounts for 64% of the decline in the region. 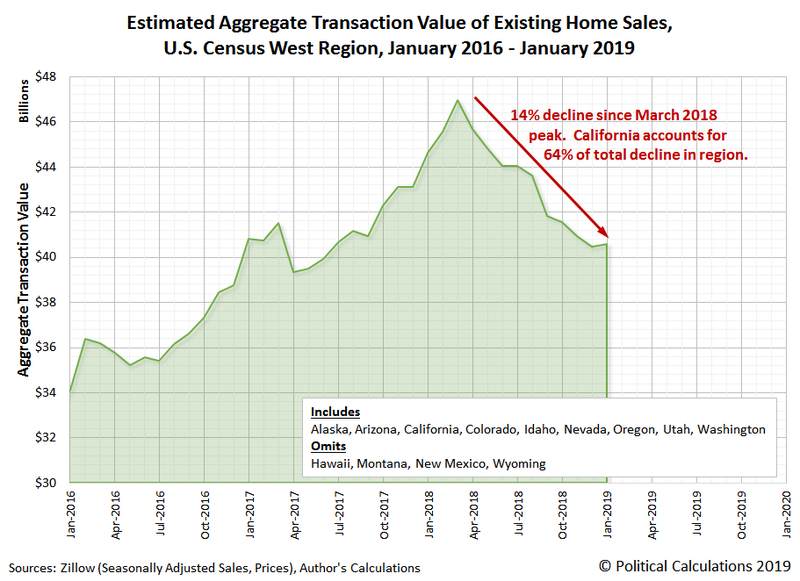 All nine states for which we have data in the region have registered declines, with only Utah and Nevada registering less than double-digit shrinkage in the total valuation of their existing home sales from March 2018 through January 2019.